Whether your site visit is next week or five years from now, accreditation is something all institutions need to have on their minds. Therefore, proactively mapping your curriculum while being conscious of accreditation is a best practice. However, if you have not been proactively mapping your curriculum, don’t worry! It’s never too late to do so, including leveraging an assessment software to tag exam items to provide the necessary data to close the loop on your mapping process. 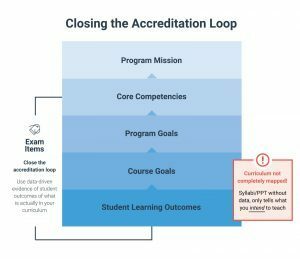 So, what exactly do we mean when we say “mapping your curriculum for accreditation”? Let’s take some time to actually define the task at hand. 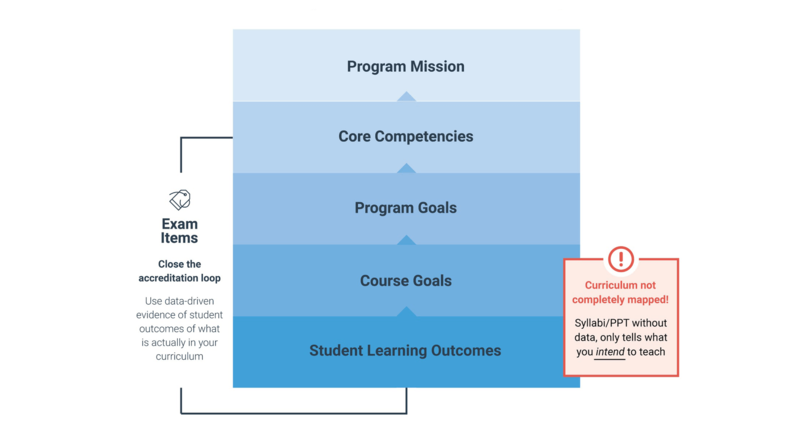 Curriculum mapping is the (mostly) linear process of mapping your curriculum from your program mission all the way down to your student learning outcomes. As the graphic below illustrates, each level of the curriculum is supported by the level below it while feeding into the level above it. During this process, it’s important to identify each of these key levels in your curriculum and map through them accordingly. When completing your curricular mapping process, it’s necessary to go beyond your student learning outcomes to truly close the loop. When we show accreditors syllabi, student outcomes, and content from our courses, we’re actually indicating only what we intended to teach. Therefore, it’s imperative to include our assessments to appropriately close the mapping process. This doesn’t mean that you simply print your assessments and share them with accreditors. Like every other part of the curriculum mapping process, we need to leverage our exam items with a purpose. Mapping assessment questions to categories that are associated with the appropriate competencies for your accrediting body AND to your student learning outcomes finally completes the process of closing the loop. This allows institutions to indicate exactly where the necessary major competencies are assessed in our programs while also mapping our assessment items through all levels up to our mission. Using this method of mapping exam items to all levels of institutional outcomes, you now have the data-driven proof that your curricula are meeting accreditation standards and you’re ready for your site visit. Learn more about how an assessment software can help ease this process here.